With the weather turning cold again, people's thoughts are turning toward preparation for winter. Helping people to be prepared for winter roadside emergencies is a great way for a business to develop a reputation for caring. The first concern in a winter emergency is staying warm until help arrives. Ideally, that means running the vehicle's heater. If the heater is working and there is plenty of fuel, warmth isn't a problem, but possible carbon monoxide build-up is. A small shovel is invaluable for making sure that the exhaust pipe remains clear so that the air inside the car remains fresh and healthy. If fuel runs out or the heater isn't working, staying warm becomes more of a challenge. At the very least, every passenger needs a warm blanket and winter hat. Many people going from home to school or office don't dress for bitter weather if they're going to be in a heated vehicle, so having warmer clothing on hand can be a life saver. Heavy socks, insulated boots, a warm coat, and gloves or mittens can take the misery out of waiting and help prevent dangerous hypothermia. Emergency warming packs can help to keep hands and feet toasty. Staying warm burns calories. High-calorie snacks and drinks will be welcome in an emergency. Many emergency ration kits come equipped with chemical heaters. A little water causes a chemical reaction that heats the food or drink to 200 degrees. Not only does this reaction heat the food or drink, but it also provides additional warmth. The chemical heaters can also be purchased separately. Most people nowadays have cell phones with them to call for help, but it's still important to be visible. Roadside flares are a quick attention-getter and can be seen even in bad weather conditions. Many items for emergency kits are readily available at Logo'd Gear. 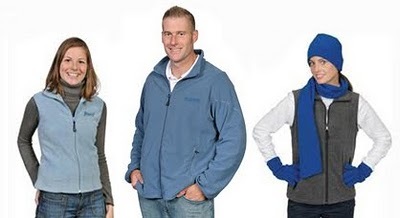 Blankets, hats, scarves and gloves, and custom sweatshirts are easily available, branded with any company logo. Logo'd Gear also offers cold-weather and auto kits, pre-loaded with an assortment of necessary items for winter emergencies. Even single-use hand warmers can be emblazoned with the company logo.